ID Card Designer - Corporate Edition provides facility to design all type of ID cards such as student ID card, Employee ID card, Security ID card and other type of photo ID cards. 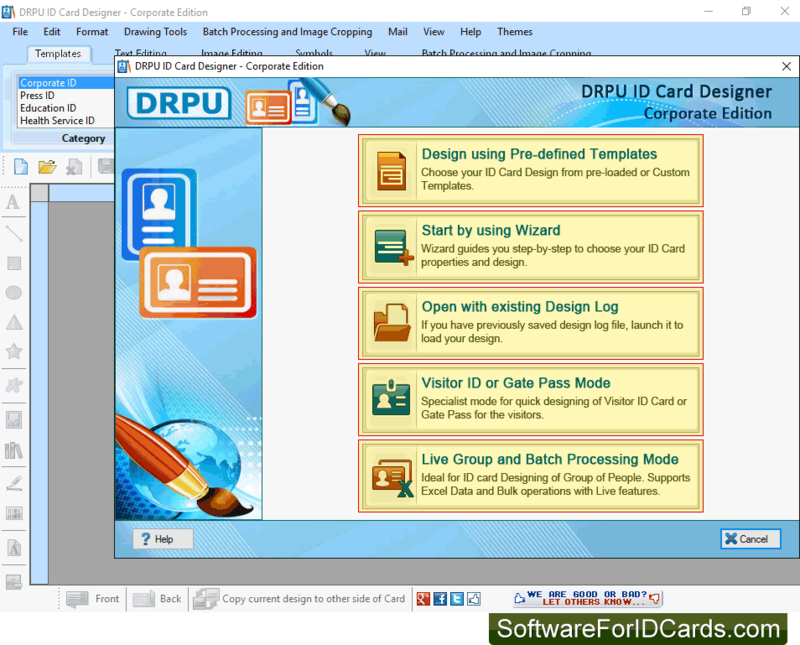 Software provides Live Group and Batch Processing Mode for designing multiple ID cards using excel data. ID card creator program also provides option to quickly generate Visitor ID card or Gate Pass for visitors using Visitor ID or Gate Pass Mode. You can also manage all visitors records by adding visitor information to the database. Software also provides option to create ID card easily by using pre-defined templates. You can add photo on ID card either using camera option or browse image which is saved on your computer system. 1. Software provides facility to export designed ID card as image, as PDF and as template. 2. You can copy current card design to the other side of the card. 3. Design ID card in various shapes like rectangle, rounded rectangle and ellipse shape. 4. Design ID card with one or two sided as per your requirements. 5. Software enables you to send designed ID card at any specified email address using inbuilt email setting feature. 6. Software provides facility to save your designed ID card log for future usage. 7. You can save designed ID card in different file formats such as PDF, BMP, JPEG, GIF etc. 8. Design ID card using various image designing tools such as line, text, barcode, picture, rectangle, signature, ellipse etc. 9. You can crop single or multiple images for ID card using image cropping tool. 11. Software provides facility to create new format ID card or edit existing ID card format. 12. Software provides color and background settings of ID card including Solid color, Gradient, Image and Style settings. Extreme Search Corporate Edition (Popularity: ) : A pay-per-click search engine that features a category editor section and seperate affiliate program area. You can set a signup bonus, use PayPal/2Checkout/Clickbank to process sales, integrate the affiliate programs of Amazon and Searchfeed.com, upload Excel spread sheets, and more.